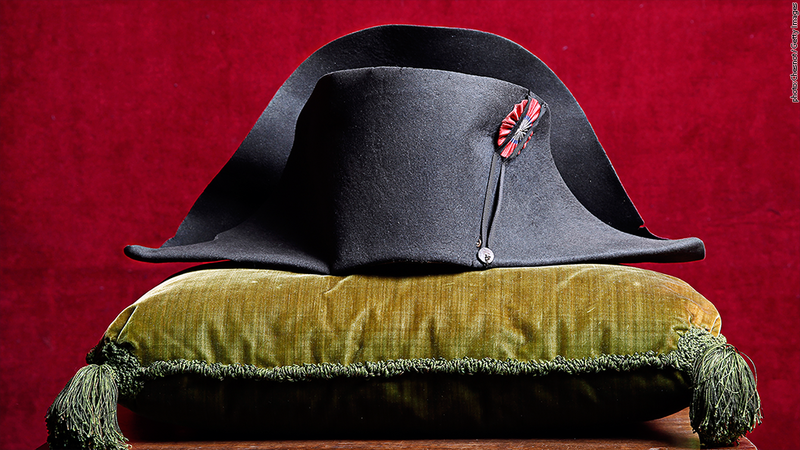 Napoleon's hat is set to go on the auction block this weekend. It's expected to sell for as much as 400,000 euros ($500,000). Monaco's royal family, which owns the items, is auctioning them off in France and plans to use the proceeds towards refurbishing their palace. "I prefer to give a new lease [on] life to this collection of objects and relics ... rather than to see them remain in the shadows," said Monaco's Prince Andrew in a written statement. The items were originally collected by the prince's great grandfather, Louis II, who was a big admirer of Napoleon. The collection includes typical items, such as medallions, coins, keys, paintings and sculptures. But some surprising pieces are also up for grabs, including Napoleon's old socks, which are estimated to be worth as much as 5,000 euros ($6,230). As for the hat, it's expected to fetch up to 400,000 euros ($500,000). Not all items are prohibitively expensive. Other items from his era, such as small medals, are estimated to sell for as little 100 euros ($125), allowing everyday collectors to get in on the auction action.